Published: January 16th, 2019 by admin. Filed in Outdoor Umbrellas and tagged Cantilever Umbrellas. At Ashadya Shade Sails & Blinds, we love cantilever umbrellas – we always recommend them as the best choice when it comes to outdoor umbrellas. And there are many good reasons behind this too. If you’re looking to purchase an outdoor umbrella in Sydney and you’re trying to decide which umbrella to buy, give cantilever umbrellas serious thought. To help you understand why cantilever umbrellas are so great, here are some of the reasons why we love them so much. While cantilever umbrellas may look more complex than the standard outdoor umbrella, they are quite easy to set up and operate. They can easily be installed as wall-mounted units or with the help of an upright supporting base. Because of this, our team can install cantilever umbrellas in just about any location without facing too many hassles. You should note that cantilever umbrellas are so easy to set up that you can even do it on your own -without any professional help. All you need to do is to set up the base or wall-mounting unit, fix the umbrella frame and dress the canopy. These umbrellas include a quick release sliding system for opening and closing, which facilitates installation with minimum effort. The gas strut ensures balanced and very light operation. There is no heavy lifting. Standard outdoor umbrellas cannot be adjusted. Because of this, they provide shade only at a fixed angle. This can be a problem because the angle of shade varies with the movement of the sun throughout the day. On the other hand, cantilever umbrellas can be rotated to change the angle of the shade. Our customers love cantilever umbrellas because they can be rotated to offer 360° shade. We even have a tilting version. By choosing a cantilever umbrella over a standard outdoor umbrella, you can enjoy a cool, shaded area regardless of the angle of the sun. While standard outdoor umbrellas have centre posts, cantilever umbrellas are mounted to the side, so the mast does not restrict movement under the umbrella canopy. Cantilever umbrellas come in a range of styles with the most common canopy shapes square, or octagonal shapes. And, cantilever umbrellas come in different size and fabric colour options as well. Regardless of whether you’re looking for an outdoor umbrella for domestic or commercial use, a cantilever umbrella will enhance the ambience and add a classy look. Ashadya Shade Sails & Blinds can even incorporate custom branding on our cantilever umbrellas. With us around, you needn’t look for outdoor umbrellas elsewhere in Sydney – we can offer you an aesthetically pleasing cantilever umbrella. High-quality cantilever umbrellas, such as ours at Ashadya Shade Sails & Blinds are capable of offering up to 99% UVR protection. This is because our range of cantilever umbrellas is manufactured using top-grade shade fabrics. Unlike standard outdoor umbrellas that may use inferior grade fabrics, all of our umbrellas offer excellent sun protection. 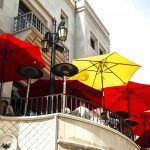 We (as well as our customers) love cantilever umbrellas, and there are several reasons behind this. Cantilever umbrellas are easy to set up, they are capable of offering 360° shade, they come in a range of shapes, sizes and styles and they offer excellent sun protection. 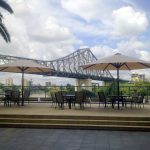 If you’re looking to purchase an outdoor umbrella in Sydney, consider purchasing cantilever umbrellas over standard outdoor umbrellas. Regardless of whether you will be using it in a residential or commercial setting, cantilever umbrellas are an excellent choice. 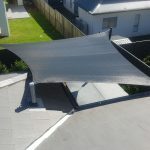 For the best quality cantilever umbrellas in Sydney, look no further than Ashadya Shade Sails & Blinds. We offer a range of cantilever umbrellas including Rotating & Tilting Cantilever Umbrellas, Multi-Mast Cantilever Umbrellas, and Rotating Cantilever Umbrellas, so you’re sure to find the perfect fit for your needs. 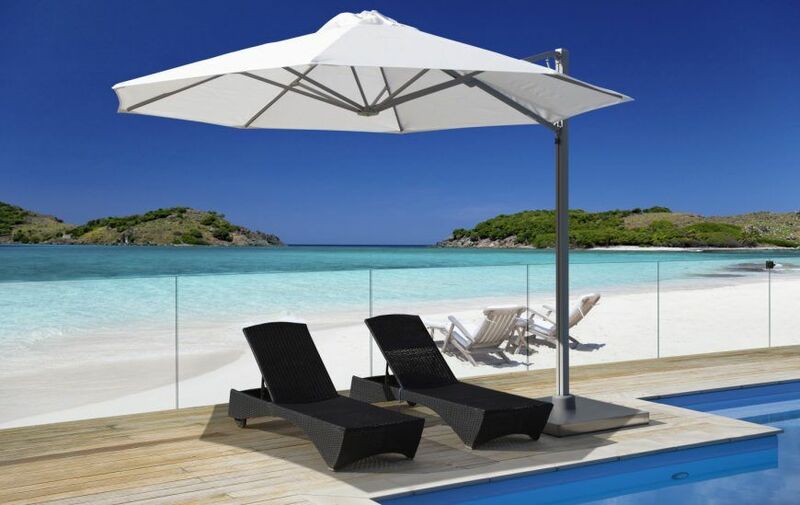 Call us on 1300 570 901 for a free quote on our cantilever umbrellas today!